Canadian Calum Neff, the world record holder for fastest half-marathon with a stroller, will run the 211-lap indoor marathon in New York City on Saturday (Photo: Julie Neff). Months after setting the Guinness world record for fastest half-marathon pushing a stroller, Canadian Calum Neff will be eyeing another world record: breaking 2:27:21 in the indoor marathon, a benchmark held by American Michael Wardian. This time Neff will be without a stroller. The 211-lap attempt will take place at the Armory New York City indoor marathon on April 9. The indoor track at the Armory is 200m meaning that Neff will have to run just short of 211 laps to ensure he hits the 42.195K marathon distance. He’s using the event as tune-up for the Wings For Life World Run on May 8 in Niagara Falls, Ont. The combined men’s and women’s race takes place at 1:30 p.m. EDT on April 9. There are no Canadians, as of the current start list, in the women’s indoor marathon. The race will be streamed live, for free, on Saturday. LINK. RELATED: No wind, no rain, no elevation change: Indoor marathons. The Scottish-born Canadian lives in Houston and set the world half-marathon record with a stroller at the Katy Half-Marathon in February with his one-year-old daughter Holland. He ran 1:11:27, which has been since ratified by Guinness as the official record. That was worthy of a fist pump (see below) as he approached the finish line at the Texas race on Feb. 6. Wardian and Neff have plenty in common as the American holds the world record in the marathon with a stroller at 2:42:21, a time which Neff has indicated he would like to break. The women’s indoor marathon record of 2:53:53, which was set in Toronto, could also fall. Separate records are kept for outdoor performances and indoor performances though the marathon is rarely contested on a 200m track. There’s a US$5,000 bonus for the world record at the April event in New York City and an additional US$1,000, US$500, and US$250 prize for the first three finishers, respectively. Neff is a father of two and works as an operations manager in the oilfield. He juggles training with family time and regularly does runs at absurd times in the morning or at night. RELATED: Canadian father of two runs, works full-time, and still sets records. “During a Gulf of Mexico project, I worked most of a regular office day, did a quick mile repeat session on my way to a client’s office where I stayed until 4 a.m., and just barely made it in time to the local running store for the weekly 5 a.m. bagel run,” Neff told Canadian Running in February. The popularity of the indoor marathon has grown recently with events throughout North America offering the rather painful-sounding distance. 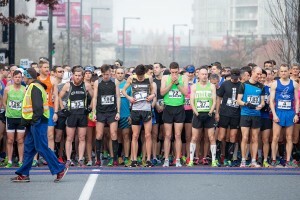 Toronto, for example, is the site of an annual indoor marathon at York University as runners are able to escape the outdoor elements including rain, wind and elevation. Live results will be available. LINK. You can read the full interview we had with Neff here. They’ll change direction at the one-hour mark of the race. It’s sure to be painful regardless. curious how someone can manage a diaper’s change in a race? have in mind the child that bare sitting down this long. He and his daughter were only out on the course for 70 minutes during his February race with the stroller so hopefully wasn’t an issue.